Although the dangers of radon gas in the home have been well publicized over the last few years, few peopl e think of it coming in through their water supply. Even fewer people have their water tested for radon. Radon gas is created when the radioactive mineral radium degrades. Radium leaches from phosphates and other radium bearing rock formations (including granite) into the water. Radon will quickly escape from water as soon as it hits the air. As water is run in the kitchen faucet or as one is taking a shower, the gas separates from the water and is inhaled. A major health concern is the exposure to radiation. Elevated radioactive intake has been found to cause genetic disorders, birth defects, and many types of cancer. Radon gas may cause lung cancer and the longer you are exposed, the higher your risk. It has been linked to stomach, liver and brain cancer, also. In Maine, 25% of lung cancer deaths have been linked to homes with radon gas in the well water. Please see section Resetting Backwash Cycle for resetting the time instructions. To remove radon from a water system it is a simple matter of releasing the gas in a safe manner. 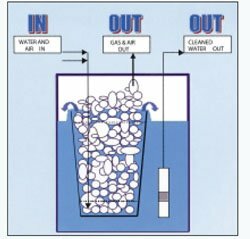 Your water is aerated and blown inside of the system. The radon is bubbled up and out, so that clean water is delivered to your home. The radon gas is vented outside over the roof of your home. 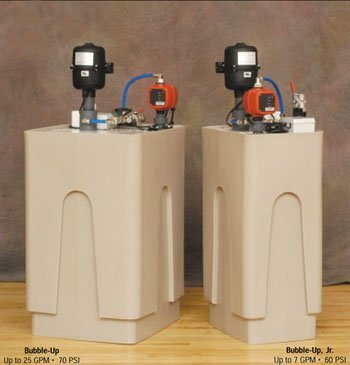 A radon Bubble Up system takes up less space than a standard size washing machine. Carbon filters require very little maintenance but the media bed inside the tank does eventually wear out. The media will need to be replaced every 2-5 years, depending on the level of impurities and amount of water used daily. If there is a power outage, or after daylight savings, you will need to reset the timer. This is important to reset because you don’t want to unknowingly use water during a backwash cycle. Please see section Resetting Backwash Cycle for resetting the time instructions. Your water is aerated and blown into the inside cup. Radon is bubbled up and out. Your cleaned water overflows the brim of the cup and a built-in pump automatically delivers it to your home. 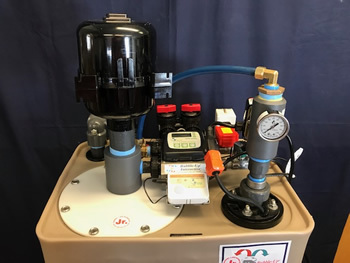 Call Haskell’s Water Treatment Inc. today at (207) 594-4947 or 1 (800) 244-4947 for more information about Radon treatment.